Denon CEOL RCD-N8 review | What Hi-Fi? Denon’s CEOL RCD-N8 is the latest box of musical tricks to come from the company’s CEOL range, adding some improvements and enhancements on 2011’s five-star RCD-N7 system. Simply put, if you’ve got some music to play, there’s a good chance the RCD-N8 will find some way of playing it. That’s because this small unit is capable of an awful lot, showing similar talents to the Award-winning Marantz M-CR610. 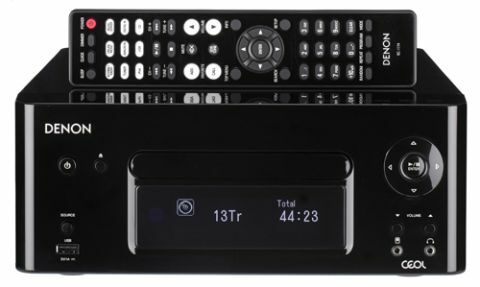 In terms of physical media, the RCD-N8 is a CD player, but also features the old 30-pin iPod dock for playback and charging, hidden under a panel on the top of the unit. Elsewhere, you can hook up an Apple device or flash drive to the Apple-certified, front-mounted USB, or use the 3.5mm port for other gadgets instead. There’s both AirPlay functionality and wi-fi on board, as well as FM and internet radio, though sadly no DAB. Finally, the RCD-N8 is DLNA 1.5 certified for streaming music from a connected laptop or NAS drive, and has a digital optical in for connecting to your TV – it makes for quite an impressive feature list. That said, the elephant in the room is the strange lack of Bluetooth (the Marantz M-CR610 is guilty of the same omission). With so many connectivity options, it seems like quite an oversight not to include such a popular feature found across such a wide range of devices and manufacturers. We tested the RCD-N8 as the main unit only, pairing it with Q Acoustics 2010i speakers to put it through its paces. Denon does offer a matching pair of speakers for the system, but the 2010is are much better, and work out around the same price or cheaper, when bundled with the system by retailers. Fire up the Denon and you’re launched into a quick set-up mode, which helps you to quickly and easily get the system onto your wireless network, using the OLED screen on the front of the unit and the included remote. The screen is crisp and bright, and makes navigating the menus easy. Play a CD and the Denon shows off a warm and punchy character, with a decent level of detail and a well-balanced sound. It’s no slouch – there’s plenty of get up and go here – all helped along by an expressive, fluid midrange, and a tight, controlled low-end. There is a subwoofer output should you wish to add more weight to the RCD-N8’s sound, but we never felt like it needed it. The treble steers clear from sounding harsh or thin, and playing The Fratellis’ Henrietta, cymbals stay crisp and realistic. It’s not the most detailed or refined treble we’ve heard – the Marantz CR610 does a better job there – but it’s far from offensive to the ears, which is often half the battle on smaller systems. Organisation isn’t class-leading either. We found the RCD-N8 sounded best when playing simpler music rather than anything too busy or complicated. Spotify will be a useful addition for millions of subscribers (you will need to be a paying subscriber to use the feature), and is well integrated into the system. Once online and signed in, you’ll have the ability to search Spotify as normal or access your playlists, all displayed on the OLED screen – Last.fm works in a similar way. Playing music through Spotify sounded a little more congested and disorganised than playing via a CD, and dynamically lacked a bit of punch. However, there’s little doubt most will be happy to trade a little clarity and refinement for the pure convenience Spotify streaming offers. Playback was stable throughout too, no doubt helped by the inclusion of Wi-Fi Multi Media, a feature that prioritises audio data on a network over less time-sensitive applications, lessening the chances of dropouts or interference from other connections. Playback via USB offers a fair amount of format support, playing MP3, WMA, AAC and ALAC, plus FLAC and WAV in 24-bit/192kHz quality. Feed this system the best quality you can and it will reward you in its performance, but lower-quality material is given a spit and polish and sounds perfectly listenable too. When you put this system in context, it’s very hard not to draw comparisons with the Marantz M-CR610, and Marantz’s unit takes the Denon when it comes to refinement, organisation and fine detail. There’s a bit more punch here, compared with the Marantz’s smooth character, but everywhere else, the Denon just falls a little short. But then the Marantz is £100 more expensive, which is a consideration to be made given that many will be paying for speakers on top. While it might not quite be a match for the Marantz, the Denon RCD-N8 is definitely worth a look if you’re looking for a compact system that does a bit of everything at a reasonable price.